"Woodlands is on the border between Wiltshire and Hampshire, in a quiet country lane, with bedrooms overlooking dairy fields." 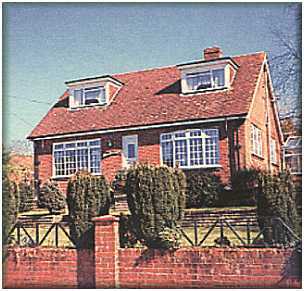 Woodlands is on the border between Wiltshire and Hampshire, in a quiet country lane, with bedrooms overlooking dairy fields. The New Forest, the historic city of Salisbury and the ancient market town of Romsey are all only a matter of minutes away. Southampton, with their docks and the West Quay shopping centre, is also an easy journey. Ferries to the Isle of Wight sail from Southampton and also from Lymington. Some rooms have en suite facilities and all rooms have hot and cold running water, colour TVs and tea making facilities. Guests are provided with their own bedroom and front door keys and may come and go as they please. We have a comfortable lounge with colour TV and separate tables in the dining room. Our aim is to provide a friendly personal service, home cooked food, and a comfortable stay in pleasant surroundings - a Home from Home. Children are welcome and we make reductions up to the age of 12 and also reductions for senior citizens. No evening meal on Sunday. Avon Beach - Mudeford, Bournemouth. Breamore House - New Forest. Buklers Hard - Beaulieu River. Cinemas - salisbury, Southampton, Winchester. D-Day Museum, HMS Victory, Mary Rose, HMS Warrior - Portsmouth. Exbury Gardens - New Forest. Florence Nightingales Church at East Wellow. Lepe Beach - Hampshire Coastline. Long Down Dairy Farm - Ashurst, New Forest. Royal Victoria Country Park at Netley. Swimming Pools - Salisbury, Romsey Rapids. Theatres - Plaza at Romsey, Playhouse at Salisbury, Mayflower at Southampton. And much more all within easy reach. 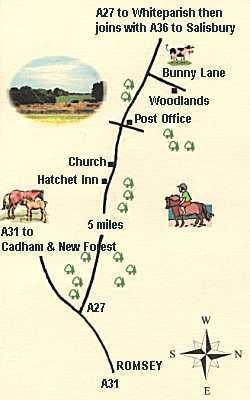 The A31 at Ower can be reached from the M27 Junction 2. Romsey can be reached from the M27 Junction 3. From Salisbury take the A36 and turn left onto the A27 to Whiteparish at Brickworth Corner.